Originally, I planned to share this post with Marc. In reflection, I think this post should stand alone. Reflecting on my first year of counselling makes my successes, struggles, observations and learning apparent, showing how I have changed professionally and personally. 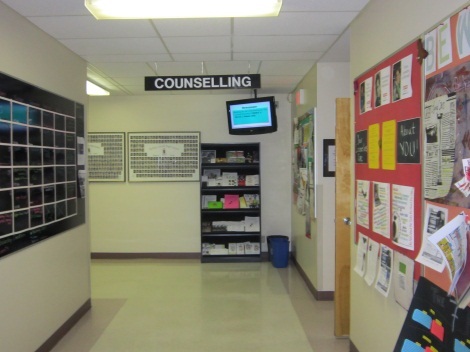 In many ways, it appears that my experience in my first year of counselling mirrors my experience in my entire Master’s program. My studies taught me about models and theories of counselling. In my first year I have worked to apply my eclectic approach centred upon Solution Focused Brief Therapy (SFBT). I have learned the strengths and limitations of SFBT, how to apply its approaches and techniques effectively, and in what contexts it is appropriate. I have applied elements of REBT, CBT, Narrative Therapy and other theories as I have built my knowledge and skill base. I realize that I need to increase my knowledge and skills in a variety of therapeutic models through further professional development. My studies taught me about the ethics of counselling. In my first year I have been exposed to a number of ethical issues and questions as I have considered issues of boundaries, self-care, confidentiality, and proper conduct. I have learned through my own work, the experience of others, and consultation what potential concerns can arise and how to work through the decision making process. I have had my own conceptions challenged, and have had to learn how to balance the rights of parents, students, my employer and myself. My studies taught me how to work with a client to create a positive working alliance and how to develop an effective intervention plan. My first year has been a tremendous learning experience, as I have played ‘guess and test’ with different approaches and techniques. I have learned how to conduct myself in a way that creates a positive relationship with a client, while still remaining true to my personality and principles. I have learned the value of a conceptual plan, as I struggled in some sessions to adjust to new information or move forward in a deliberate manner. Videotaping my sessions has provided me with tremendous opportunity for growth, as I have observed and reflected upon my demeanor, approach, and delivery. I have surprised myself, as I begin to feel that I could actually ‘do this’. I came into my first year very aware of my naïveté. I battled ‘imposter syndrome’, worrying that clients or colleagues would question my abilities as much as I did. I wondered if I would be able to handle all the potential scenarios placed before me. Even at the end of my first year, I am aware of my inexperience and the potential struggles of a novice counsellor. However, I have learned so much and come so far that I believe I am well-equipped to begin my journey as a counsellor. Personally, I have been surprised by what I have learned from clients, how my experience has impacted me, and how I have been able to manage emotionally. I have seen the value of self-care, boundaries, and realistic expectations. I believe that my experience has made me a more reflective person, a better listener, and more aware of the perspectives of others. Professionally, I believe I have made the right career choice. I plan to work in schools, helping students with their academic and personal needs. I have learned how to work with other professionals, how to communicate with parents and clients, and what my role as a counsellor entails. I am both overwhelmed and excited by the amount of growth I have ahead of me; through experience, reflection and professional development, I plan to keep learning and developing. If I could give any advice to a new counsellor facing the first year of their new career, it would be this: You have chosen a profession with a steep learning curve, a variety of potential presenting issues, the emotional impacts of others, and tremendous demands of your time, energy and patience. You will be frustrated and challenged, misunderstood and exhausted. So relax and enjoy it. You’re much better at it than you think you are, there are many resources and supports out there for you, and the job is incredibly fulfilling and rewarding. You’re making a bigger difference than you realize. Isn’t that what we want? My final thoughts : I have been fortunate to work alongside such a *fabulous new school counsellor. Fly on your own Marc ( well sort of ) but remember to always consult, consult, consult, collaborate, collaborate, collaborate, continue to tweet and continue to make a difference. You most certainly did this year. I look forward to Marc’s School Counselling blog as school counselors know reflection is always a good practice.